Want a well-trained dog but don’t have the time? Or perhaps you have the time, but just need a little more help. Sign up for the Nitro K-9 Hands Off program and let us train your dog for you. Here’s how it works: A Nitro K-9 professional handler will come to your home—or any other location you specify—and train your dog for you in a daily, hour-long session (excluding weekends). At the end of the program, we will schedule one or two sessions with you to cover what your dog has learned, and show you the leash work so you can just keep on going. 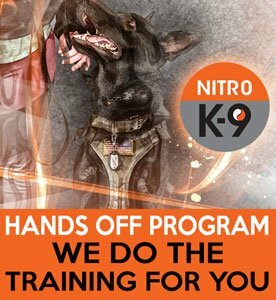 What makes the Nitro K-9 Hands Off program different from other hands-off training programs is that it’s extremely flexible. Many clients love that we come to their home. A lot of dogs do better when they’re otherwise in a familiar environment, plus we can offer guidance around specific behaviors in the home. You can also be as involved as you want, whether you just want us to work with our dog while you’re at work or you want to watch as we train. Looking for a board and train? We can do that too. Just board your dog at a registered facility and we will work with your dog there. We generally work with the Adorable Pet Lodge. In addition, you can use Hands Off for Level 1, Level 2, or Level 3. Full Level 1 obedience requires a total of 14 sessions and is our most popular offering. ** Hands Off offered in 3 and 7 class bundles for existing clients. Why are there 7 lessons for in-person training, but 14 sessions for the Hands-Off program? Our regular obedience training, where we work with you, is conducted approximately once a week, and you have time to practice in between session and check in with your trainer. The Hands Off program is completed within 14 hours total. If you train my dog, will my dog follow the commands just like he does with my trainer? Yes, but not right away. You will need to be trained too! That’s why we include two free lessons in our Level 1 14 lesson package—to show you what your dog has learned, and how to do the leash work and other commands. Why do you only train during the weekday and not on weekends? We like to give the dogs a little bit of a break. Keep in mind that you hired a professional trainer—and trust us, your dog will need some rest. Can you help us with issues like barking, jumping, counter surfing, digging, crate training, etc.? We are happy to evaluate the individual situation or issues and provide guidance and techniques for you to use. That’s why we’re here! Click the sign-up button below. Choose the Level 1 training program for your dog’s size and follow the prompts. This will give us that background we need; then we’ll contact you within 24-48 hours to discuss your issues. From there, we’ll set up an evaluation. Please note that there is no financial obligation until we meet in person for an evaluation.